Note: This post originally appeared a few years ago. One of the problems with online content is that good stuff drifts to the bottom. This is a good tip, so I’ve pushed it back to the top of the feed. My frugality sometimes gets the best of me. I’m too cheap to buy acid brushes to use for spreading glue, even though they only cost 15-25 cents apiece. Every now and then I get some, but I don’t want to take the time to clean them, and I feel guilty if I don’t. I don’t need a glue brush often. Most of the time I lay on a bead from the glue bottle and rub the two pieces of wood together. 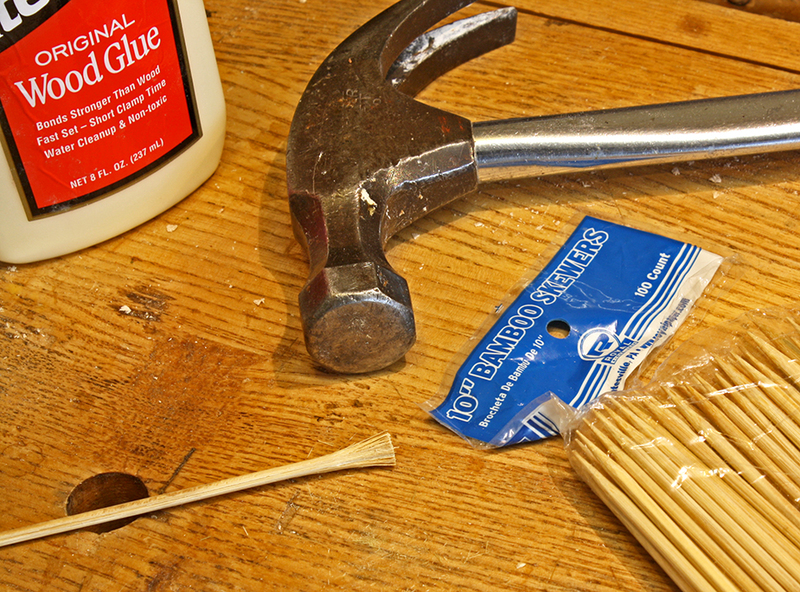 The other day I was putting together some mortise and tenon joints, and decided I should spread the glue before assembly. 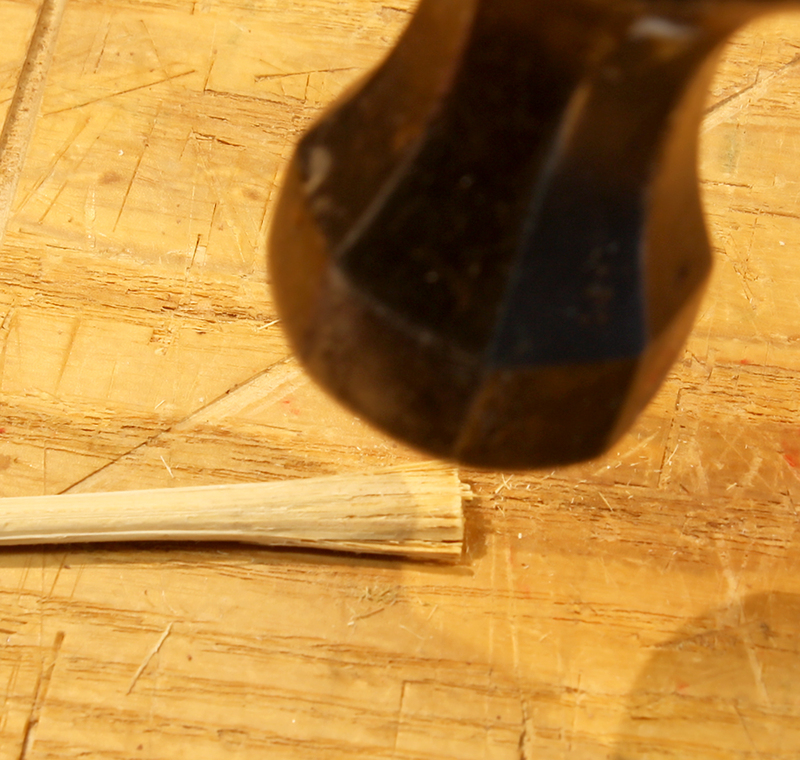 My glue-brush alternate is often a sliver of scrap wood, but I didn’t happen to have the right size handy. What I did have was a box of bamboo skewers. I use them mostly to make ka-bob, but they can be handy around the shop. A buck and a half for a hundred of them is a pretty good deal, but you can find them at restaurant supply places in boxes of 1000 for less than $10. 1000 bamboo skewers will last awhile, even if you make kabob all the time. 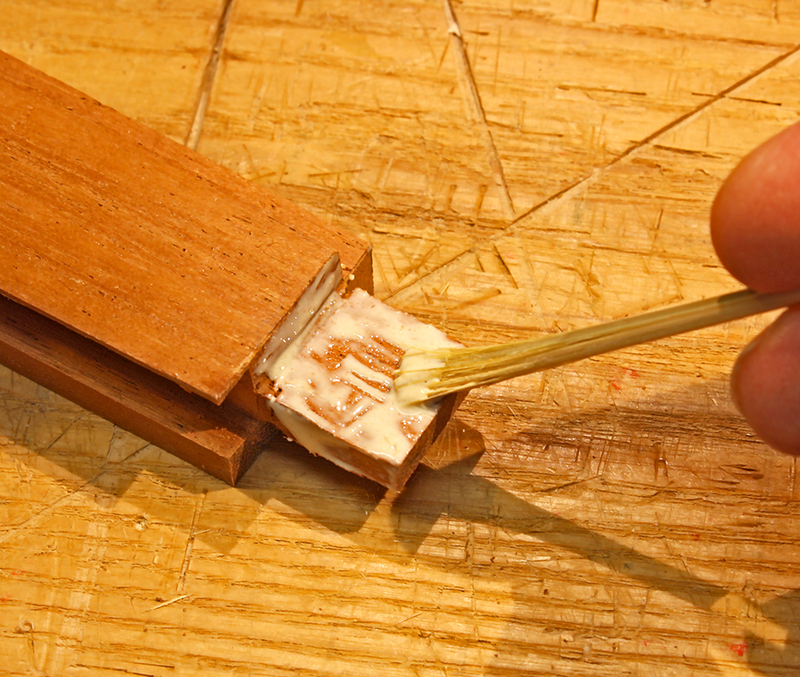 The standard skewer works as well as a little stick, but while I was spreading glue in my second mortise, inspiration struck. I picked up my hammer and bashed the end of the skewer. That separates the fibers and spreads them out. The more you pound, the more brush-like it becomes. I turned it a few times as I pounded to even out the bashing. Total time for this operation is about ten seconds. The result is a nice, stiff brush, small enough to reach into narrow places and just the right consistency for spreading glue evenly. It worked so well that I contemplated going into the bamboo glue brush business. If I could get the right people to jump on the band wagon, this could be the next big thing. I continued to assemble the project and set my new glue brush aside. I didn’t bother to clean it, and because I bought the box of 1000 (my cost was less than a penny) I didn’t feel guilty about it. The next morning I had a dried out and useless brush, but so what. As I was on my way to throw it in the trash, inspiration struck again. Only about 1/2″ on the end of the skewer was no good, I still had the rest of the skewer. So I picked up a chisel and cut off the end. If I don’t lose the skewer, I should be able to repeat the process of smash, glue and cut 15 or 20 times before it becomes to short to use. And if I do lose it, I still have hundreds of these kicking around. I tend to think that the ghost of my grandfather (arrived in the US from Paisley ca. 1910) pokes me now and then with ideas like this. I like, thanks for sharing Bob, and Merry Christmas. Sometime I need a little stiff brush to scrub something. I’ll have to try this. Great idea, and I consider it a Christmas gift. Merry Christmas to you and your followers. As usual the best ideas are the simplest! I”m a little late to the party here, but have tried this out and it works fantastic. I always have a supply of these in my shop because I use them as decorative dowels in the small boxes that I make, because end grain bamboo looks cool on contrasting woods. I would also like to mention that corn dog sticks work just as well for larger glue brushes, I also have a ready supply of these as I use them in the same way I use the skewers. Thanks for the great tip.